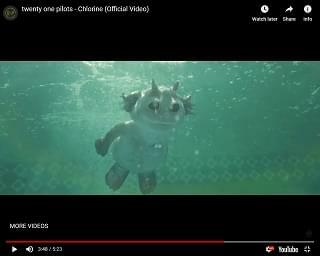 The visual features an animated creature that the duo has referred to as “Ned.” Tyler Joseph and Josh Dun seem to catch the creature’s attention by filling up a swimming pool with water and chlorine. Twenty One Pilots are kicking off a world tour soon in support of the album. The trek hits North America on May 1st in Monterrey, Mexico, with dates running until June 30th in Columbus, Ohio.